The destinations that are popular with African safari tours are Kenya, Tanzania, Botswana, South Africa, Uganda, Zambia and Zimbabwe. Not sure which destination to travel to? see details on safari holidays in East Africa and Southern Africa and how to choose the right destination. Click on the link at the end of the African safari tours for each destination to get more details and easily book online. All the details are handled for you in this 10 days private safari in Kenya. From the choice of accommodations, meals, game drives, services of a professional driver/guide and a custom 4×4 vehicle with a pop-up roof for easy game viewing and photography. From Nairobi, Kenya’s capital drive to Amboseli National Park, where you’ll see spectacular views of Mount Kilimanjaro, Africa’s highest mountain. The park is home to numerous plain game, many bird species and it’s one of the best places in the continent to view large herds of elephants up close. From Amboseli, fly to Nanyuki (via Nairobi), then continue by road to Samburu National Reserve in northern Kenya and get to see over 450 species of birds, the Big-5 – elephant, lion, leopard, buffalo and rhino and animals unique to this part of Kenya. These animals, called the Samburu ’Special 5’ consist of the Grevy’s zebra, Somali ostrich, reticulated giraffe, beisa oryx and the gerenuk, a long-necked antelope that feeds while standing on its hind feet. Visit Lake Nakuru National Park, among the popular national parks in Kenya where you get a chance to see pink flamingos, pelicans, white rhino, waterbuck, giraffe and impala. Finally visit Masai Mara National Reserve, Kenya’s most famous game area. The reserve offer exceptional year-round game viewing, more than 570 species of birds and home to the yearly wildebeest migration, which take place between July and October as over 2 million wildebeest, zebra, topi and other plain game trek from Tanzania’s Serengeti Plains to the reserve and back again following the rains. The reserve is also one of the best places to take a hot-air balloon safari. Your African safari in Kenya starts in Nairobi by visiting the Sheldrick Elephant Orphanage, founded and managed by Daphne Sheldrick. Here you learn about elephant conservation and meet elephant calves, orphaned by poachers, before they are reintroduced to the wild. Next, visit the Karen Blixen Museum, dedicated to the author of Out of Africa. Then visit the Giraffe Centre, a non-profit organisation focused on saving the Rothschild’s giraffe. Here you learn about this sub-species and have the opportunity to feed them. Visit Amboseli, Samburu, L. Nakuru and Masai Mara. Visit Amboseli, Samburu, L. Nakuru and Masai Mara. Fly to Bwindi Impenetrable National Park via Entebbe for gorilla trekking, a truly memorable experience. Bwindi Impenetrable National Park is a UNESCO World Heritage Site and home to almost half of the world’s population of mountain gorillas. Note: There are a limited number of permits issued on a daily basis, so booking early is recommended. Visit Masai Mara National Reserve, Lake Nakuru National Park – a bird watchers paradise and home to flamingo (Greater and Lesser), pelicans and more than 450 species of birds. Wild animals that can be seen include black and white rhino, baboon, waterbuck, impala and buffalo. 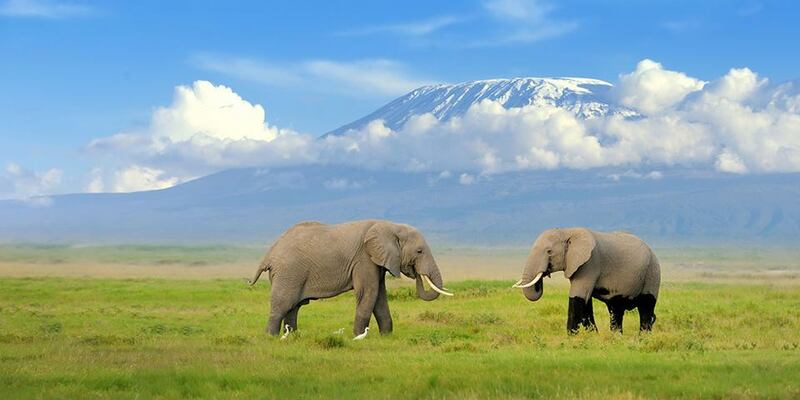 Visit Amboseli National Park. Your African safari tour departs Nairobi and stops at famed Mount Kenya Safari Club for lunch and stunning views of Mount Kenya. Continue to Samburu National Reserve, home to diverse population of animals. Drive to Ol Pejeta Conservancy, the largest black rhino sanctuary in all of East Africa. Beyond the Big 5, you may spot cheetah, zebra, gazelle and if you are lucky, you may even see rare wild dogs. Stop at the Chimp Sanctuary, which was established to provide a long-term home for orphaned and abused chimpanzees. Here, see the chimps and learn more about their plight. Visit Lake Nakuru National Park and Masai Mara National Reserve. Fly back to Nairobi from Masai Mara where your African safari in Kenya ends. The safari tour takes you to Amboseli National Park, best known for spectacular views of Mount Kilimanjaro, the highest mountain in Africa at some 19,341 feet. The park offers great opportunity to get close to African elephants and it’s home to 450 bird species. You might also spot cape buffalo, wild dog and zebra. Visit Ol Pejeta, Lake Nakuru National Park and the Masai Mara National Reserve. Fly back to Nairobi from Masai Mara. If you’re short on time, this Kenya safari tour serves up the colours, culture, and wildlife of Kenya in four incredible days. Embark on a safari in the legendary Masai Mara in search of the Big Five in a 4×4 safari van designed for wildlife viewing. Wilderness camping in permanent tents enable you to hear the sounds of the planet’s most amazing animal life. The varied wildlife and birdlife of the Mara and culture of the Masai people all come together to provide a spectacular safari experience. The Masai Mara offers excellent year-round game viewing and it’s one of the best places in Africa to see big-cats. Your daily routine at the Masai Mara will vary, as on some days picnics will be taken out on extended half-day or full-day game drives. Between July and October you can witness the great migration. The Masai Mara is also one of the best places to take a balloon safari. These tours are scheduled and all-inclusive. You can book any of these and other vacation packages easily online here. If you’d like tailor-made / custom Kenya safari tours, click here to submit an inquiry. Kenya has many mountains and hills and attracts many adventurers each year. Mount Kenya, the country’s highest and the continent’s second highest is regarded as the most visually stunning of the snowcapped African peaks. It offer easy and challenging ascents with spectacular scenery. See the Mount Kenya climbing tours. From Arusha travel south to Tarangire National Park, where baobab and acacia trees dominate the landscape. Here search for the African elephant, eland, zebra, and buffalo that congregate around the waterholes. Visit Lake Manyara National Park, Ngorongoro Crater Conservation Area and Serengeti. Serengeti National Park is Tanzania’s largest and most famous park. Home to the annual Great Migration of wildebeest and zebra, generally between late November and July, it attracts visitors from around the world and is great for game viewing year round. Fly back to Arusha and connect to your flight to Zanzibar. Visit Tarangire National Park, Lake Manyara National Park, which is at the base of the Rift Valley escarpment. This small park is ecologically diverse, with grassy plains, groundwater forests and alkaline Lake Manyara itself. During a game drive, watch for African elephant, baboon, giraffe and buffalo. Visit Lake Manyara and the Serengeti. Serengeti National Park is Tanzania’s most famous park. Explore this vast park in search of the Big 5 — lion, leopard, buffalo, elephant and rhino — as well as an abundance of other animals, including cheetah, giraffe, gazelle and eland. Visit Tarangire National Park, Lake Manyara National Park, Ngorongoro Conservation Area and Serengeti National Park. Fly to Selous Game Reserve (via Arusha & Dar es Salaam), the reserve is Africa’s largest at more than 15,000 square miles. It is relatively untouched by humans and a UNESCO World Heritage Natural Site. The reserve is home to roughly half of Tanzania’s elephant population and numerous plain game including leopard, wildebeest and wild dog. From Arusha travel south to Tarangire National Park, which offers panoramic views of baobab and acacia trees. Embark on an exciting game drive in search of elephant, eland, zebra and buffalo that congregate around the waterholes. Visit Lake Manyara, Ngorongoro Crater and Serengeti National Park. Fly back to Arusha and connect to your flight to Zanzibar then transfer to your beach hotel. Zanzibar offer beautiful white sandy beaches and activities such as snorkelling, sailing and surfing. Visit Tarangire National Park, Lake Manyara National Park and Ngorongoro Crater. The crater is technically a caldera — the world’s largest unflooded, in fact, at more than 2,000 feet deep with a floor covering over 100 square miles. Game viewing here is fantastic, as most of the animals stay in this area year round. Visit the Serengeti, explore the highlights of Stone Town on a private guided tour and transfer to your beach hotel for a 3-day beach holiday in Zanzibar. Visit Tarangire National Park, Lake Manyara National Park, Ngorongoro Conservation Area and the Serengeti. Explore the highlights of Stone Town on a private guided tour. Start with a walking tour including the Old Fort, slave caves, National Palace and the spice markets. Afterward, visit Jozani Forest, where you will take a walk through the forest with a local ranger. Learn more about the forest fauna, walk through the mangrove swamps and see the rare red colobus monkey, found only in Zanzibar. Visit Tarangire National Park, Lake Manyara National Park, Ngorongoro Crater and Serengeti National Park. Fly to Selous Game Reserve (via Arusha & Dar es Salaam), for some off-the-beaten-track African safari experience. The reserve is home to elephant, lion, wild dog and other plain game. Fly to Zanzibar for a relaxing beach holiday. Click here to book any of these and other all-inclusive scheduled African safari tours. If you would like tailor-made / custom Tanzania safari tours, click here to submit an inquiry. Many holidaymakers to Tanzania choose to climb Mount Kilimanjaro, Africa’s highest mountain at 5,895 meters above see level. Click here for Mt. Kilimanjaro climbing tours.